Does your young lady love pink? For the little girl who is now turning into a little lady, pink princess attire is in order. Show her that you are excited about her turning 15 and want her to look as pretty as a storybook heroine. This delicate and charming tiara is silver-plated and decorated with pink rhinestones that sparkle when the light hits them. The front forms a heart, and in the middle of the heart dangles a pinkly crystal "15" jeweled centerpiece. The tiara can be adjusted to accommodate for larger and smaller head sizes. It secures with small combs at the sides. 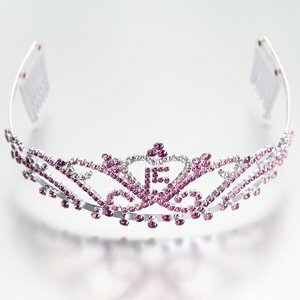 Make her day into a magical one with this sweet and sparkly crown.